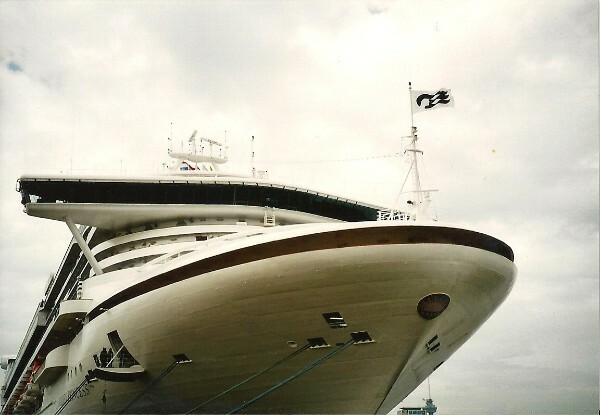 In april 2001, a few years after the introduction of Grand Princess, Golden Princess came into service with some short cruises out of Southampton. This new princess was also slightly bigger then her older sister, although you can't see this in any way. She measures some 108.865 tons, has a lenght of 289,51 meters, a width of 36 meters and her draft is 8 meters. She has room for 3100 passengers in total, measured at 2592 persons on a two-per-cabin basis. They are cared for by 1100 crewmembers on the ships' 17 decks, of which 12 are available to the passengers. In contradiction to the first ship of the class, Grand Princess, the ship was registered directly at Hamilton, the Bahamas instead of in Liberia. 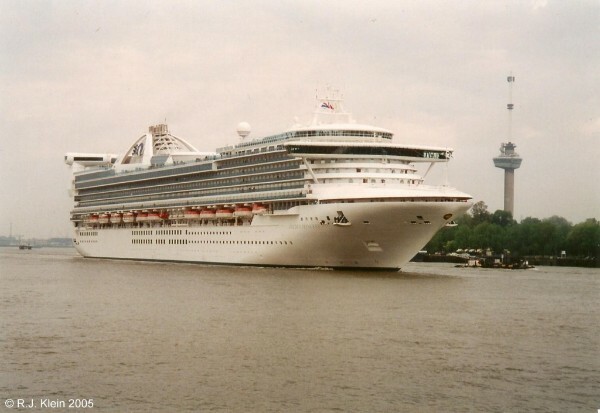 Golden Princess, the second time the name was used with Princess Cruises (the first one was a short charter of one of the original Royal Viking Line ships), floated out of her building dock in Monfalcone, Italy where she had been built under yardnumber 5956. On the 28th of april 2001, the ship was stationed at Southampton from where she undertook several short 'shakedown' cruises. Her first long cruise started from Southampton to the Mediterranean at the 16th of may of that same year. Normally, the ship sails Mediterranean cruises in summer and Caribbean cruises in winter. The ship was officially named by actress Jane Seymour in Fort Lauderdale at the 21st of october 2001. Jane Seymour is known as the Bond-girl in the 007-movie 'Live And Let Die' (1973) and also from the American TV-series 'Dr. Quinn, Medicine Woman (1993-1998). Golden Princess from a weird angle in Rotterdam, showing off her Princess Cruises flag. In 2019, Golden Princess will be added to the fleet of P&O Australia. First, a new 133.000-ton ship was ordered for the subsidiary, then the 113.000-ton Carnival Splendor was to be transferred down-under as the new ship was allocated to Carnival Cruise Line instead. In 2018 was announced that now the 109.000-ton Golden Princess was coming to Australia in its place. So the ships kept getting smaller and older. When Golden Princess enters her Australian service, she will be 19 years of age.